My partner was installing a wooden floor in a neighbouring village yesterday. When he came home he said he wasn’t sure if the local butcher there was either very clever or very stupid. Due to the growth of our customer base lately we found our home-build database was beginning to let us down. We could either spend hours (days more likely) of redeveloping, enhancing the database ourselves – and still end up with not exactly what we need – or finally spend some money on a proper CRM (Customer Relationship Management) software package. The latter won, and instead of wasting hours searching online for the best program I called my friend Lesley (computer training). She said I could choose between ACT or Mamut. Online research told me that ACT was from Sage (and I hate Sage), so onto the Mamut website. With two clicks I downloaded the whole scenario of Business software of Mamut, you then select the specific program you want to test out (free for 30 days!). I was immediately hooked and (through The Laptop Man also recommended by my friend Lesley) bought a licence. Licence arrived (by email) the following day. Yesterday (two working days after buying the licence) I received a courtesy phone call from a William at Mamut. It turns out he is my personal Support Manager! He asked me if I liked the program (yes, definitely), if I had any problems with the program (yes, one minor problem, which he solved immediately by telling me where in the program I could change this little issue) and if he could be of further assistance (no, thank you, not at the moment, you’ve been great). One of my personal (free) email-addresses is being flooded with spam lately. I don’t use that address much, but it’s always handy to have an alternative if the main email server is down. Lately I also heard a lot about Gmail, the free newer version of Google mail. Onto the website, found Gmail and found a sign-in box: Sign in to Google mail with your Google Account. Great, I already have one, so that’s handy! “Sorry, this is not a valid Google Mail login. But you just asked me! To cut a long story short, it took me over 15 minutes to find out that anyone not having a mobile number that’s listed in the 9 Countries Gmails’ sign-up page mentions has to be invited by an American friend! Can I be bothered? No, not anymore. one company/product I definitely will recommend to everyone, one company/product definitely not. And the butcher? My partner is still talking about it, so he’ll be doing alright I think. Shall I ‘wrap’ it for you? After reading Permission Marketing by Seth Godin (which, again, made me stop and think several times) I decided on two things: focus our marketing strategy for next year on this principle, and that something was missing in Seth’s book. But sending out RAP-messages (I like acronyms, but ARP sounds too much like selling a loan or mortgage, so allow me some creativity ;-)) doesn’t tick all the boxes in turning strangers into friends, friends into prospects, prospects into happy customers. It ticks more boxes than spam, more boxes than adds in newspapers and magazines, and more boxes than a website that doesn’t entice ‘visitors’ to take action. But something significant is missing to achieve that ultimate goal of marketing: turning a stranger into a happy customer. Worthwhile, or in marketing terms: WII.FM (What’s in it for me). The messages should also be worthwhile, a promise that the one who benefits most from the message is the reader/listener. Then it ticks all the boxes. What truly great businesses (and business people) do. Just finished re-reading Good to Great of Jim Collins and co. I won’t go into too much details what’s it all about, you should read it yourself. The book (research-project) constantly made me stop and think. Then what is the point of life of a business? Core values and core purpose (together = core ideology) created by constantly following that one concept that a (any) company can become the best in, is passionate about. Consistent little step by consistent little step to become a great sustainable business. Consistent in turning the flywheel from build-up to breakthrough. “The single biggest danger in business and life, other than outright failure, is to be successful without being resolutely clear about why you are successful in the first place. Good to Great is filled with core values that any business could - should follow. And it’s not just Jim Collins and co that ‘preach’ passion, Peter Carruthers article this week preaches the same. Fred from WWC pointed to a very interesting and very true item in one of his post on the Ideate-blog. We all know the statistics on failing businesses: 4 out of 5 (UK figures, SA it seems it’s even worse: 95%) fail within the first 5 years of trading. Mostly due to lack of cash, lack of understanding of ‘the books’, lack of understanding that appointing someone responsible for the number crunching is a very important part of growing (sometimes even the survival of) your business. In his latest post Fred calls such a person a “Financial Cornerstone”. I totally agree with this statement and think that every business (small, SME or Multi-National) should have at least one. Even a one-man(woman)-band. In that regard that a one-man-band should dedicate at least a certain amount of time to ‘number-crunching’, or have a practical system in place to ‘ease’ the work and find a dedicated (part-time) bookkeeper as Financial Cornerstone, in the end it’s worth the ‘investment. As fervent reader (and writer nowadays) and all the things you can learn from reading (not just about business, but about all you can even think of) I didn't think twice when I read Seth' blog about this charity: RoomtoRead. And I've taken up his challenge: create a Squidoo lens and donate your 'earnings' to this Charity. There were one or two items I had problems with, while creating this Lens, like why on earth can't you link to books that are only available on Amazon.co.uk? Obvious reason I think is that Squidoo is still USA orientated, but hopefully that'll change?? But have a look at my Lens, or even better: create your own and more and more children all over the world will be able to do what most of us take for granted: books, books and more books and places to read available for them. It happened last month and it happened again this week. Aggressive sales tactics from a competitor (operating National) turned two prospects into happy customers for us. So, please go ahead with your aggressive and intimidating tactics, dear competitor, we will always base our dealings with customers on mutual Trust and Respect: trust in our own products and service, prices that reflect real value for money and respect for the wishes, circumstances of our customers. I don’t understand that in this day and age of changing marketing ideas (proven ideas), based on one-to-one interactions between provider and customers, companies still think they can force their products by pressing the prospect for hours and hours. In the end the product is even heavily discounted in order to just get the sale. Does that build trust in the products or company – if you can give that much discount what’s the quality going to be like - or respect for the customer – if I said yes an hour ago I would have paid over the odds - ? Or as Seth says: marketeers (read companies in this case) should not confuse polite fiction with fraud. Why not keep your dealings simple: these are our products, these are our prices, this is what we can do for you as respected customer – you, the customer, decide if it fits your bill. No fiction, no fraud, only politeness. They are. Our company use them on a weekly bases if not daily. New prospects are added; when they become customers our database is adjusted accordingly and so is our little software program we use to send out email newsletters etc. Handy, time and 'paper' saving tool, databases are. Then why does one of my suppliers keep sending me 'newsletter' emails filled with offers we can benefit from once we become a customer? This blog is only one month old. It’s my second typepad blog (see WYL FAQ for my first blog in typepad). 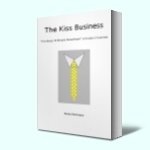 Where the first one is purely business orientated: helping our Wood You Like customers in a modern online way, the Kiss2 blog is completely different: focusing on business concepts (not just our own), marketing ideas and overall trying to make business simple. I’m discovering benefits/features of Typepad on a weekly base. Just ‘discovered’ the TrackBack feature (by reading Seth’s blog and who doesn’t read Seth’s blog?). Where you normally expect comments being listed on the daily topics; Seth only shows ‘TrackBack’ entries from other bloggers. A great way to ‘land’ on other interesting blogs. I know that when you make a ‘comment’ on a blog’s article you can link to your own blog also, but the best part of track-back is that it immediately brings you to a ‘sort-like’ or related topic. “In a nutshell, TrackBack was designed to provide a method of notification between websites: it is a method of person A saying to person B, “This is something you may be interested in.” To do that, person A sends a TrackBack ping to person B. TrackBacks are typically sent from one weblog to another when one publishes a post that includes a link to the other weblog. I just feel this feature/benefit has been named wrongly. The only one tracking back is the writer; for readers of a) the original post and b) the link ‘related’ post on someone else’s blog they ‘Trek’ forward, not back. When blog b also gets ‘TrackBacks’ from other bloggers the fun part starts: as reader you can ‘Trek’ forward to the next blog and to the next and to the next. I.E. instant access to associated, sort-like articles (or disagreeing articles of course) on associated or sort-like blogs. Two – you have to really focus on your own new article you want to TrackBack to make it worthwhile enough for other readers to ‘Trek Forward’. In other words, just saying: “Oh I agree totally with this blogger what he/she wrote today” I would even consider outside ‘trek-iquettes’ (coining a phrase based on “netiquettes”). And from the TrackBack list on that topic I ‘Trekked’ forward to Huey’s World which is an interesting blog on its own. And I’m sure I will be Trekking Forward on many more occasions. Warning: if you are not interested in accounting, bookkeeping software, stop reading NOW. Or if you are not, but are interested in why intensive branding/marketing has more influence than logic or value for money, just skim the main text and read the last two paragraphs. Well, the new version 12 of Sage Line50 did show an improvement on some items but it hasn’t changed my opinion that it is a highly overrated, extremely expensive, very complicated and illogical accounting program. The improvements I found on version 12 have been standard features on the MYOB program for years (and are still better). Sage Line 50 is being promoted as THE accounting program for small businesses. As qualified (Dutch qualification that is, but already with 6 years experience in the UK) bookkeeper I find it lacking in simplicity, especially when I compare it with MYOB Accounting Plus (and I know I’m might be a bit biased on this account). I can’t see a starting business getting any benefits from using this Sage program and would even state it’s more hindrance than help. Behind the ‘scenes’ (various windows of the program) lays a database that is outdated in practicality. MYOB is simple and user friendly from the moment you open the program (no, let me rephrase that, from the moment you create a new company), multi-functional, logically laid out, many more features, down-loadable reports (into Word, Excel, email-files, PDF creator and even Access, where Sage only manages – since the latest few version – some reports into Excel spreadsheets). Or to say it a bit different: everything Sage version12 does, MYOB does it better (and has been doing so for years). I’ll choose MYOB any day, because it makes bookkeeping, accounting simple; is extremely good value for money and helps you (through the extensive lists of reports it can create) manage your business effectively, saving you also valuable time you can better spend on growing your business than on doing the books. But that’s marketing for you: accountants, software developers and software training companies intensively promote Sage. Could the reason be that they all get a very nice bonus from Sage every time they convince small businesses of the Sage saga? "The bottom line is it's much easier to create a Web site nowadays, and it's much easier to make money with a Web site,"
As a small business you just can’t afford not to a have dynamic, informative web-presence anymore. Just one index-page with some minor details of your products, services and contact details, which once launched into the WorldWideWeb never gets updated, isn’t a proper business mentality anymore. A website like that will be like the proverbial needle in the haystack. And it is a very BIG haystack now! Make sure your website is being found without even the need for a magnifying glass.